To release amino acids, some of which can also be used to produce more glucose. Cortisol is released in response to infection or injury. Excess cortisol causes decreased white blood cell production and activity resulting in an impaired ability to fight infection and heal wounds. This is a mineralocorticoid, which has the effect of raising blood pressure by the constriction of small arteries and the retention of fluid by the kidney. This effect is limited however by the inactivation of cortisol to inactive cortisone by a specific enzyme. It has several poorly understood effects such as increased appetite, increased acid production by the stomach and effects in the mental state (e.g. euphoria or mania). Cortisol production and release is controlled by the hypothalamus and pituitary, forming the hypothalamopituitary-adrenal axis. Cortisol is released in response to stress, which can be emotional (e.g. anxiety) or physiological (e.g. fluid deprivation or injury). 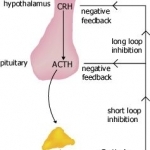 Stressors cause a release of Corticotrophin Releasing Hormone (CRH). This travels in the portal system of the hypothalamus to the anterior pituitary (the adenohypophysis). There, it stimulates the cleavage of Pro-opiomelanocortin (POMC) into several molecules including melanocyte stimulating hormone (MSH) and Adrenocorticotrophic Hormone (ACTH). ACTH travels in the bloodstream to the adrenal cortex stimulating the production and release of cortisol. Cortisol then travels to the tissues where it exerts its effects. Cortisol inhibits the release of CRH and ACTH from the hypothalamus and pituitary gland respectively, preventing further cortisol release. Cortisol is inactivated in the liver to inactive cortisone. 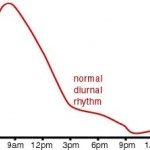 A daily pattern (circadian rhythm) is also seen, with cortisol being at it's lowest concentration at midnight, rising to a peak between 6am and 8am, falling throughout the rest of the day.